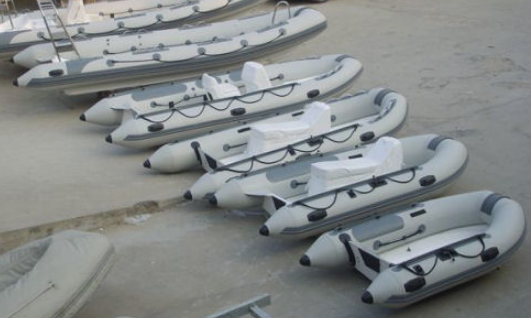 Almost every cruising boat carries at least one tender, usually an inflatable or RIB. Whether it lives on chocks on the boat deck, hangs on davits or rests, tipped on its side, on the swim platform, a tender is a both useful and expensive accessory. A little TLC every now and then will make its life longer and happier. And it will make you feel good knowing that you showed affection for the little lady you keep on the side. Maintaining an inflatable or RIB is about as easy a chore as you’ll find on board. Basically, you clean it with mild soap and fresh water after each use, rinse it thoroughly and dry it before reinstalling the floorboards, seats and other accessories. Treat the rigid parts of a RIB as you would any fiberglass boat: Wash often and wax once or twice a season to maintain the gelcoat. Novurania recommends waxing its inflatable tubes as well, once a month to protect against UV-induced oxidation, after using a hand cleaner with lanolin (the stuff mechanics swear by) to remove oil and grease stains. Even undamaged inflatables lose air, and fairly quickly at that. Most manufacturers consider a 10% loss in pressure over 24 hours to be normal, so if you have to top-up your tubes every day, don’t tear your hair out looking for a leak. That’s just the way it is. Keep the valves clear of sand, seaweed, and other junk, and you’ll minimize your pumping chores. If you need to patch a puncture, use the repair kit supplied by the manufacturer, and follow the directions exactly. Carefully clean the surface with solvent (included in the kit), especially important if you’ve used silicone, petroleum, or wax on the tubes. Work in a well-ventilated area, and don’t breathe any more of the fumes than absolutely necessary. Finally, if your tender is showing signs of age, you can give it a facelift and extend its lifespan by recoating it. Try SRC Tuff Coat, ( www.tuff-coat.com). It’s basically paint-on synthetic rubber, but applied in two layers: The basecoat restores the surface of the tubes, while the topcoat provides the finish. Tuff Coat comes in five colors – gray, white, red, black, and orange. Kits are inexpensive, and if you can paint, you can apply it yourself.